Clouds of dust billow across the pathways of Badanrero Village. As the dust picks up momentum, small children and goats scurry for shelter inside the tiny semi-permanent stick and grass-thatched structures that make up their homes. Badanrero is a remote village in Kenya, 100 kilometres from the nearest town of consequence. The terrain is flat and desolate, with nothing but dried up shrubs for miles. 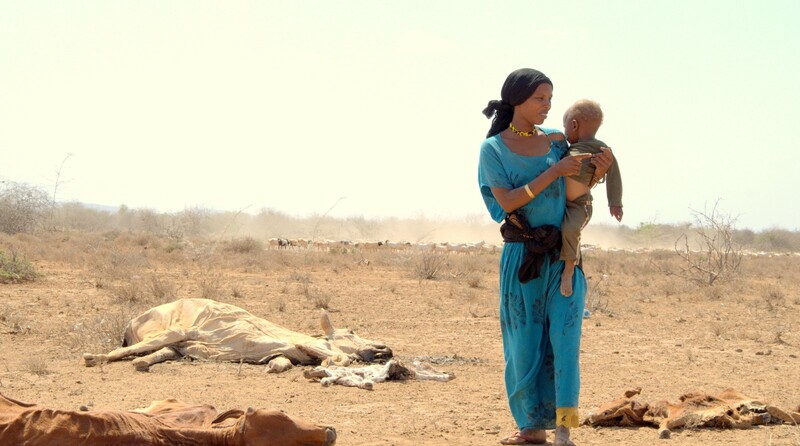 The majority of the inhabitants who live in this arid region of Northern Kenya are nomadic pastoralist families. Dabo Boru is a mother of three children who trekked here with her family from her home village 38 km away. They had to move, she says, in order to save their cattle dying of thirst and hunger. Dabo Boru and her 2-year- old daughter, Nuria, walking past their dead cattle. “I brought all these cows here in the hope that they will survive. I even bought for them fodder and water but 18 of them have already died and we are only left with three,” says Dabo. The decomposing carcasses of her dead livestock lie just a few metres from her hut. 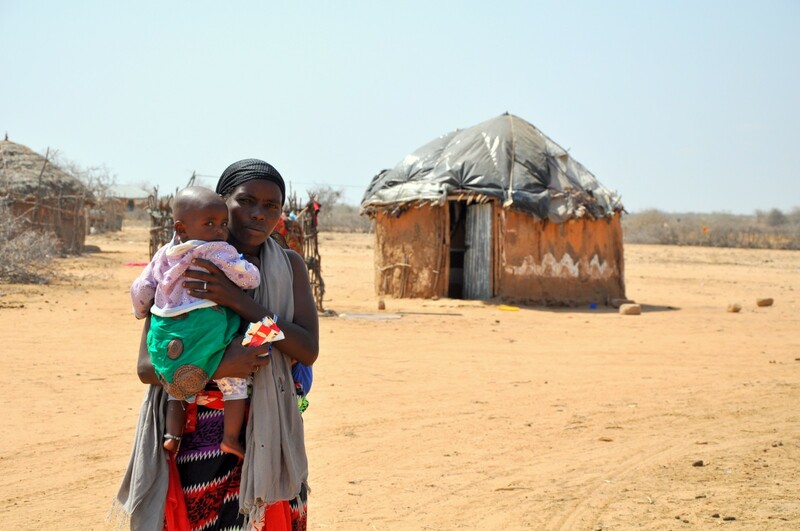 In late 2016 the usual rains that sweep across these arid and semi-arid regions of Kenya failed, and a severe drought hit, affecting over 2.7 million people. Marsabit is one of the hardest hit counties. Thousands of children are struggling to get enough food, and in dire need of treatment for severe malnutrition. 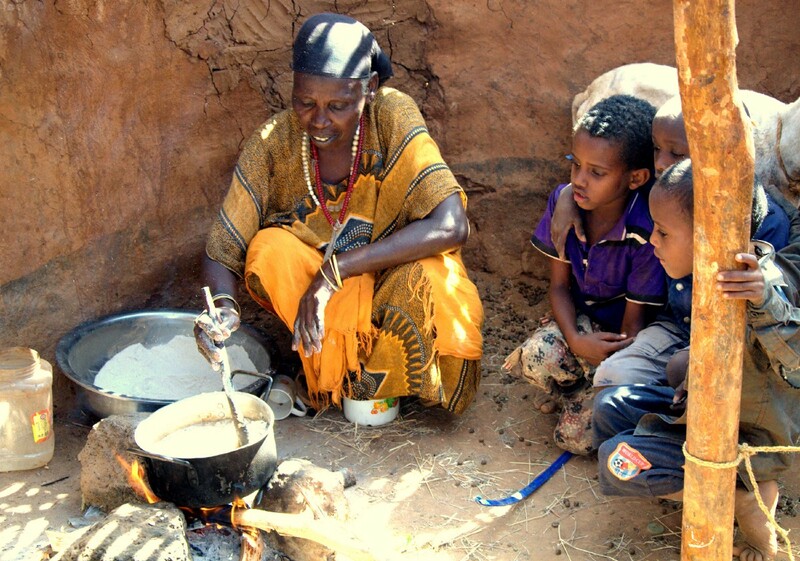 Children gather around their grandmother as she prepares the only meal of the day. Most of the natural open water sources in Moyale have dried up, putting immense pressure on the few available boreholes and dwindling water pans. Households like Dabo’s now have a walk of 10 to 15 kilometres in order to access water. “My husband has been away from home for two weeks now, looking for pasture for our remaining animals. I am now left alone to protect my children and make sure that they eat, which is very difficult without the animals that provide the milk,” says Dabo. People are at a higher risk of falling sick because they are malnourished and lack good sanitation. 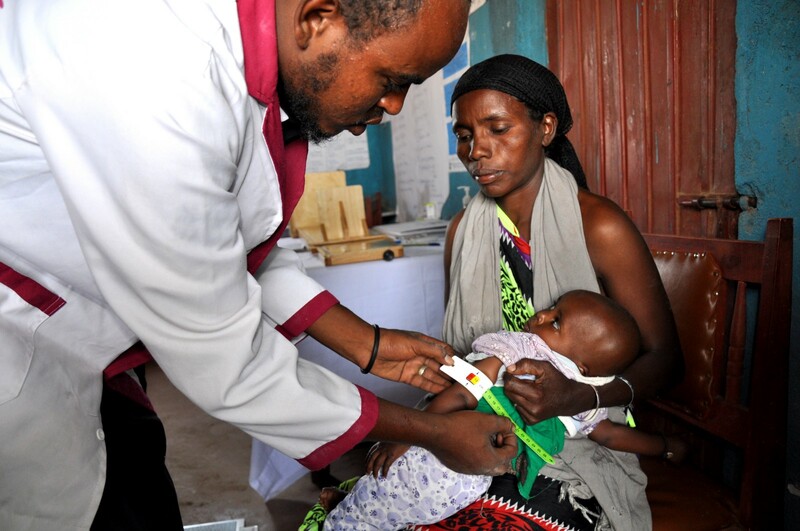 At the nearby Badanrero Dispensary, Hiliki Diba, 27, has brought her nine-month-old twins to be treated for malnutrition and acute watery diarrhoea. Children are checked for signs of malnutrition by wrapping a band around their upper arm. 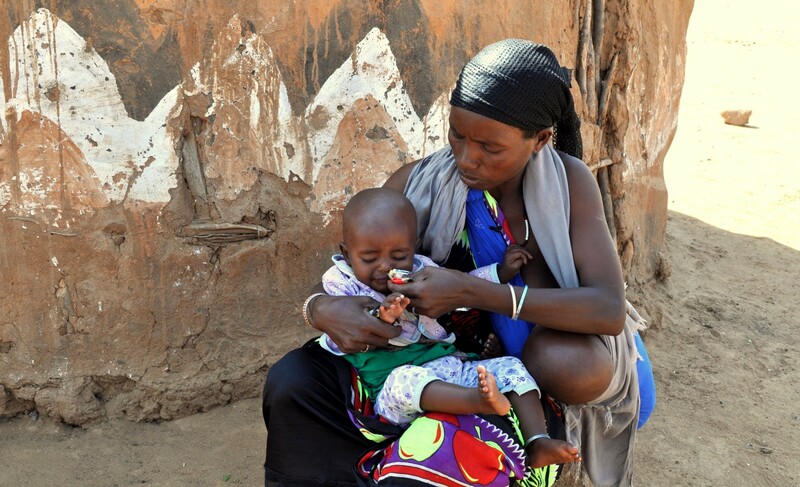 “I have been taught how to breastfeed exclusively for six months,” says Hiliki. “But having twins and the drought have made it very difficult for me to breastfeed them. I don’t produce enough milk, because I don’t eat enough — but there is no food. I am also weak and I fall sick often,” she says. Hiliki feeds one of her twins a therapeutic food sachet, prescribed to help them with malnutrition. Hiliki was fortunate. Her malnourished twin daughters were screened and admitted to a treatment clinic. As part of their treatment they’ll receive supplies of Plumpy’Nut — a peanut-based paste, fortified with nutrients and minerals, which will help return them to health. Mothers coming to the clinic are also taught basic home hygiene and nutrition practices in order to safeguard their health and that of their children during the drought. Dabo and Nuria are just two of the four million Kenyans needing food assistance. This month, Kenya’s Government expects that around four million people will be struggling to find regular food. And according to the UN’s General and Emergency Relief Coordinator in Kenya, Stephen O’Brien, the outlook is grim. With the long, hot summer approaching, affected communities across Kenya are desperately hoping that the much-needed rains finally arrive. If not, it may be the arrival of international aid, not rains, that will be the difference between life and death. Hiliki stands outside her home, having been provided with enough food to keep her twins healthy.